Many a times it happens that you have to allow remote desktop connection to your computer to get some support from somebody or allow them to work on your computer. In such a case, you want to monitor exactly what activities have been done on your computer and what files, folder and applications have been accessed. In case you can sit before your computer and see what exactly have been done then it is fine. But its so boring and time wasting. There is a better approach. You can use a tiny utility Appnimi Auto Screen Capture, which allows you to automatically take a screen capture at regular intervals and save them in a folder. You can view these screen captures at a later time to know what exactly was done at your computer. 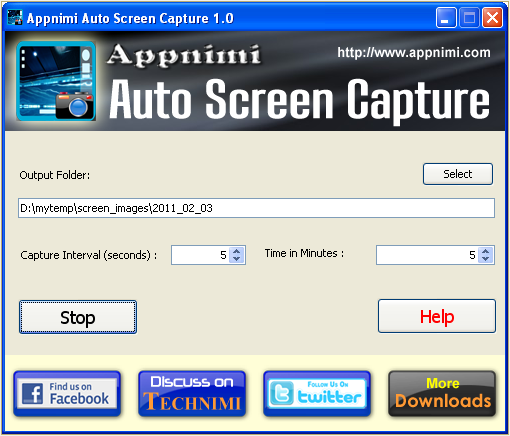 Appnimi Auto Screen Capture lets you capture screenshots of your desktop at regular intervals of time. It is a very useful utility when you would like to keep a record of whatever you had been doing over the time. It helps in analysing the time spent on a particular task. All these capturing is done automatically.